We are sure you have heard a few stories that are unbelievable, strange, spooky or all together at the same time. We bring to you cross section of best ones for starters. Did you hear the one which includes dark, dead roommate and a personal message? Then the one with a dog under the bed and the licked hand is something that’s right up your alley. After which you can play a little bit of Bride and seek with the guests at a wedding. It's up to you! 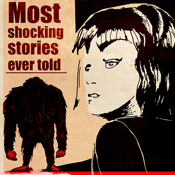 Download this awesome collection of Urban Legends and check out what we have prepared for you in our first edition, and expect free updates on regular basis. Feel free to send us a copy of your own Urban Legend, because our official Urban Legend Committee might just list your submitted legend in one of many upcoming editions. Share legends with your friends, we are sure you know at least one.